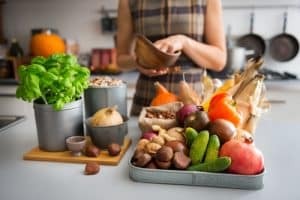 If you have PCOS you are probably more than aware of all of the possible diets there are out there that are promoted for weight loss, and in a previous post I have looked at each of these diets in detail to examine their pros and cons. Most diets that you hear about, from Paleo to Macrobiotic, are not actually researched and designed for women’s bodies. They do not take into account women’s biology, our menstrual cycles, our changing pattern of hormones – instead they are modeled on male biology and that’s why they are far more effective for men. Precisely because many of these diet protocols are not made for women, they often fail women – although some may have initial weight loss, usually this is not sustained. A study from 2012 revealed that during the luteal phase of a woman’s menstrual cycle (that’s the week pre-menstruation) women purchase much more food than they do during their follicular phase (the week after your period). To many of you, this research will come as no surprise – we know we feel more hungry during our pre-menstrual days, and that we may eat more, and may therefore buy more food. This makes sense because we need more B vitamins to help us support the corpus luteum and progesterone production. Perhaps you also have specific cravings during this time in your cycle. You might have noticed you don’t feel the need to eat that much during the first half of your cycle, but heading towards your period your hunger seems to increase and your need for food as fuel, to sustain your energy, to prevent you from feeling “hangry,” is increased. Most of the diet protocols out there do not take this information into account. Most diets proposed for those with PCOS are low-glycemic and this kind of eating plan is hard to maintain. It feels easy to do during the first half of the cycle, but once you’re pre-menstrual it’s impossible to sustain and adhere to. During the luteal or pre-menstrual phase you need more nourishing, filling, satisfying foods to prevent cravings and the desire to reach for unhealthy carbs or sugar. This is why the FLO Living protocol of Cycle Syncing your eating habits has helped so many women to lose weight and keep it off – it takes into account that you will want and need to eat different foods during your pre-menstrual phase and need foods that provide enough of the nutrients your body requires. Building this information into a diet designed for women specifically allows you to avoid the usual drawbacks of other diets and the usual obstacles and difficulties that can arise – like feeling super hungry, binge-eating, distracting cravings, and feeling deprived. When you feel hungry and do not nourish your body in the second half of your cycle, you throw your hormones off-balance and create erratic blood sugar levels. Most diets don’t supply your body and brain enough of the micronutrients that they need to create balanced appetite control-neurotransmitters and balanced metabolism-boosting hormone levels. The FLO Living protocol supports appetite control and boosts your metabolism, because it increases essential micronutrients and balances your hormones. Cycle Syncing your diet means eating different foods in different phases of your menstrual cycle – your menstrual phase, follicular phase, ovulatory phase, and luteal or pre-menstrual phase – as well as cooking foods in different ways (roasting, baking, sauteing, raw) according to those hormone patterns. Know where you are in your cycle – if you have irregular cycles due to PCOS it can be hard to know exactly where you’re at in your cycle one week to the next. But, even if you currently haven’t had a period for months, you can still start Cycle Syncing by starting with the foods I recommend for the follicular phase and following the moon phases. Start by focusing on a few of the foods I recommend for each cycle phase and build from there, adding in more and more foods as you get used to this way of eating and planning meals. You don’t need to do everything all at once, it may take a few months to get into the habit of Cycle Syncing your eating. All of the foods I recommend are outlined in my book “WomanCode” in an easy-to-understand chart. They are broken down into food types like vegetables, protein, and grains, with plenty of possible variety. Get to grips with stocking your fridge weekly with the foods you need for each upcoming cycle phase. Cooking by the FLO Living protocol is not complicated. I personally keep it super simple and cook on just two days per week, parsing out the ingredients for different meals on the other days. Once you have begun Cycle Syncing your diet, you can start Cycle Syncing other elements of your life to increase your success with weight loss – especially how you work out from one cycle phase to another. Women need to eat and exercise differently in pre-menstrual phase. Over-exercising during the premenstrual phase can actually prevent you from losing weight. Second, do you have irregular cycles? I have the Merena IUD and I do not bleed when im on my period (although my mind and body still go through the usual cycle of PMS symptoms as I can feel them). Im not exactly sure how to know which phase I am in. Any recommendations? Curious as to what you think of the IUD. Ive had it for years with no problems and do not plan on getting pregnant any time soon. Thanks! I was going to ask the exact same thing! I had Mirena for 5 years, then switched to Skyla in January (i liked the idea of reduced hormones) and have had no problems with my IUD over the past 6 years (in general i’m a huge proponent of them as they’re the most reliable form of contraceptive). Anyway, when i took the V sign type quiz, there didn’t seem to be any answers that spoke to the experience of women with IUDs (reduced period flow/ or totally absent bleeding but still signs of PMS etc). I tried to find answers to match my experience (light to no bleeding, but still severe PMS), and ended up with a strange result on the quiz… Do you have any plans to include symptoms and criteria for women with IUDs? Women respond to the IUD totally differently, and also their periods are not an accurate picture of what is happening in the body as the hormones, and sometimes the physical IUD, will affect the menstruation. Once women come off of the IUD, or the pill, it can take a few months for the body to start to express it’s natural state. I hope this helps! You sent an email last time about cycle syncing with rituals and tea or herbs extract to do. I am trying to find it to follow it and I can’t find it anywhere on your website. Can you please share the link.? I recently discovered that I have PCOS and my gynecologist very shortly pointed out all the “fun stuff” that comes along with it, before offering me hormonal treatment… I politely declined and went on a quest to search the internet, far and wide, for an alternative solution! I suddenly remembered a very inspiring TED-talk that I had seen a while back and, upon watching it again, realised that this had to be the solution I was looking for. I just joined floliving, as a member, and I am very excited to see where this leads me! Hopefully it will help me get my period back! This leads me to my question: If I manage to get a regular, monthly cycle; Is there any chance that the cysts on my ovaries eventually will disappear? My gynecologist claims that they will stay there forever, and I would love to prove him wrong ;)! One more question: Is there any chance that the webinars could be recorded so that we who live in different time zones could listen to them later? Or at least that members could get this opportunity? I live in Norway myself, and lets say that I’m not very capable of taking in new information at two in the morning…. 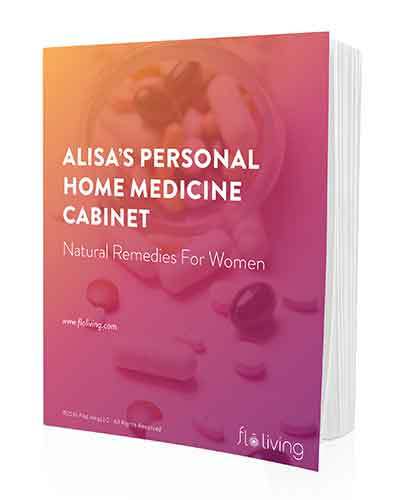 Love your approach to womens health, Alisia! So happy to have you on the program, I totally get your frustration! Yes, the cysts will go away once you start ovulating regularly. The webinars are recorded and are available for purchase under the “store” tab on the website. There is also always a free replay! I am also from Norway and suffering from PCOS like yourself. I have just started eating by Alisa’s recommendations. It’s been almost 2 months. I was wondering how you are getting along? Is it working for you? I love your blog and book and have been following your protocols for the past year. I have luckily never had any PMS issues, however I came across your work as I have been unable to conceive after years of trying. Thank you for all your advice. I gave up all alcohol, caffeine, gluten, dairy and refined sugar, something I would have previously thought impossible but actually found very easy once empowered by your knowledge. One area I am unclear on re diet cycle syncing is if any foods (recommended good healthy whole foods) are not appropriate to eat during certain phases. I do focus on the foods for each cycle, but I do not exclusively eat only from the lists. For example, are there any vegetables that are great for you in one phase, but are best avoided in another phase. Generally there is never a food you can’t have, regardless of where you are in your cycle. If you are craving something from folliuclar but you are in luteal, no worries! You simply want to lean toward the foods and food prep methods of the phase you are in! I’m starting the CycleSyncing diet this month! Yes, I have PCOS and very irregular cycles, usually only about 2 per year. After 5 rounds of pharmaceutical fertility treatments, I’m excited to give my body a break and feed it some nourishment with this diet. Do you have any info on PCOS and the Ketogenic diet? It was my good luck that I chanced about cycle syncing in an article. It talked about your book and I bought it immediately. I was amazed when I read the book. Thank you so so much for writing it down in such an easy to understand manner. I wish I had got hold your book in my twenties. I am currently 33, PCOS, very irregular periods, trying to conceive naturally since 5 years now. But I am super glad that I found your book. I am starting Cycle Syncing diet and I had 2 questions. In our country, we don’t have all the veggies mentioned by you growing naturally here. Can we leave some veggies out and have those available? During a phase, can we have veggies of another phase? The reason I am asking is that tomatoes and onions are used in Indian cooking quite a lot. I can skip it ofcourse. But was just curious whether we have to stick by these veggies as per the phase or we can add from another phase as well? Is the liver detox mentioned in your book must before i start my diet for each phase? Thank you so much. Looking forward to your reply.